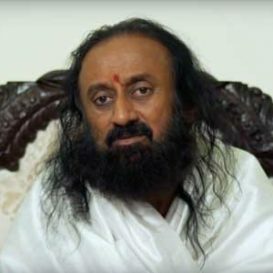 "I call on everyone to keep calm and restrain from the acts of violence." 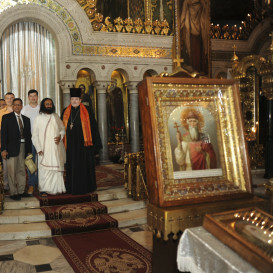 A warm welcome in Lebanon by statesman, scholars, policy makers and the general public alike. 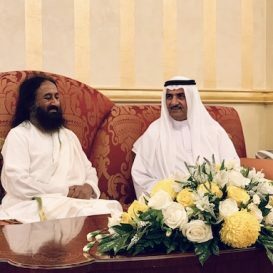 A warm reception at the royal palace in Al Rumailah by Sheikh Hamad bin Mohammed Al Sharqi, Supreme Council Member and Ruler of Fujairah and the members of the Royal family, the Emirates. 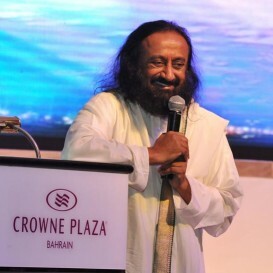 Gurudev is on a four day visit to UAE on a special invite by the ruler of Fujairah. 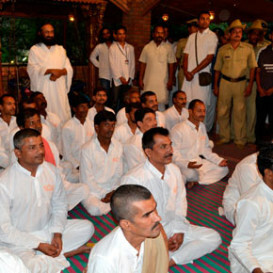 Over 150 officials of the Central Bureau of Investigation (CBI) participated in the Art of Living program. 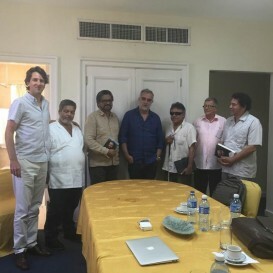 Main Muslim petitioners, Haji Mehboob and Mohammad Umar have signed a statement calling for an out of court settlement. 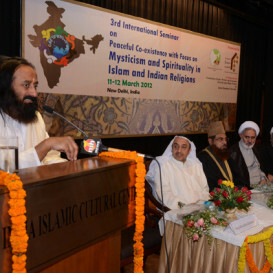 The Imam of Kevda Masjid, Ayodhya, and Imam of Tedhi Bazaar Masjid, Ayodhya, have also signed the statement. 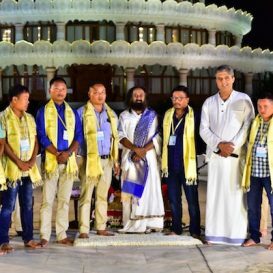 The leaders of United People’s Liberation Army, after eight years of armed struggle, pledged to choose the way of democracy and peace to achieve their goals, at The Art of Living International Center in Bengaluru. 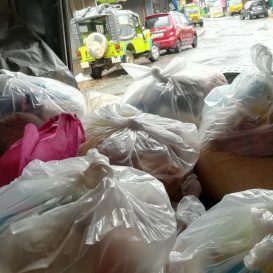 Make the Environment Free of Plastics, Not Free For Plastics! 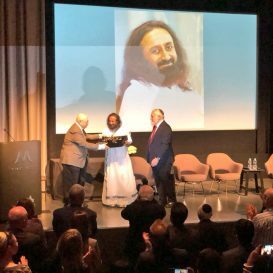 The prestigious Simon Wiesenthal Center’s International Leadership Award was conferred on Gurudev Sri Sri Ravi Shankar in a ceremony at the Museum of Tolerance in Los Angeles on Monday. 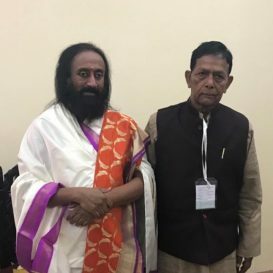 Through this letter I want to put forth the current situation and future possibility of our nation regarding the Ram Janmabhoomi-Babri Masjid issue. 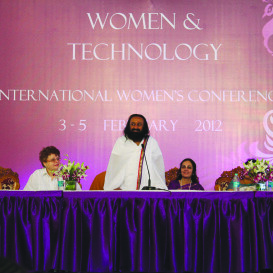 With women from 60 countries including 250 delegates, 100 rural women, 60 students from over 30 colleges, the conference set the tone for open discussions about critical issues faced by women in positions of leadership and influence and how spirituality provides key tools for their professional and personal journeys. 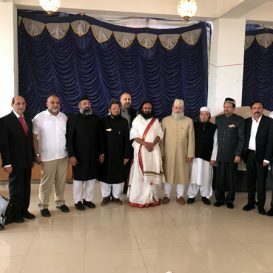 Eminent members of the Sunni Waqf Board, All India Muslim Personal Law Board and others met Gurudev Sri Sri Ravi Shankar and expressed support for an out of court settlement in the Ayodhya matter. 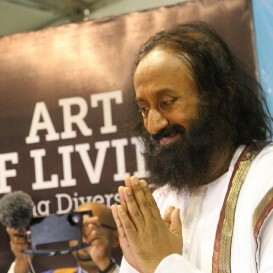 We maintain that Art of Living has not caused any damage. 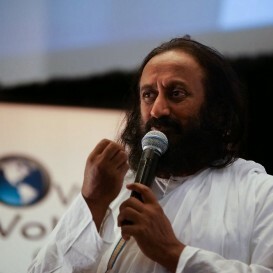 The judgement is erroneous and untenable. 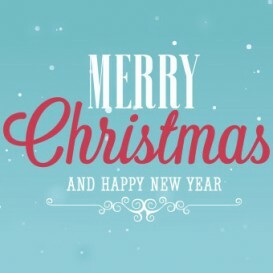 Our submissions have not been considered at all. 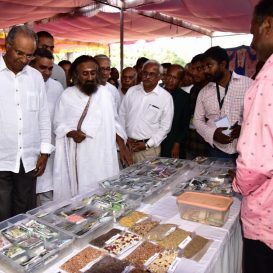 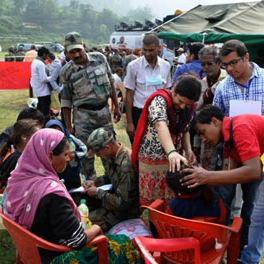 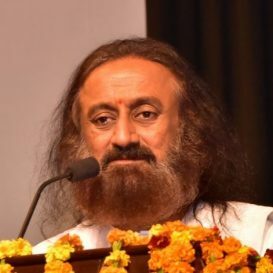 Sri Sri sends a Paigam-e-Mohabaat to Kashmir by bringing together families of slain militants, army personnel and local Kashmiris on a single platform. 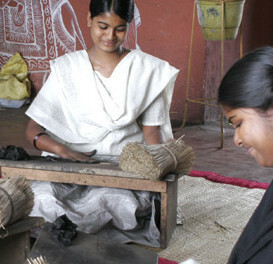 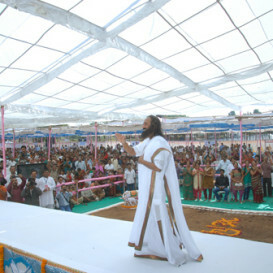 200 affected families including women attended the program. 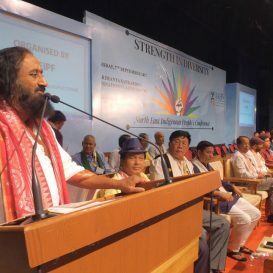 The day long deliberations at the Conference ended with the signing of the Guwahati Declaration to achieve the ultimate goal of genuine peace, prosperity and happiness for North East. 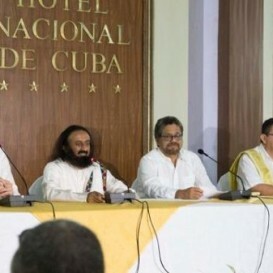 As ​​FARC transitions to politics and peace in Colombia, its​ leaders expressed their gratitude for Sri Sri's efforts in the region. 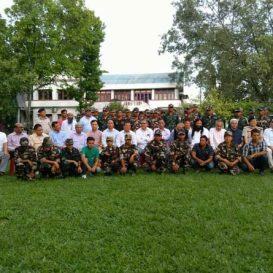 The Homecoming Ceremony of 68 cadres of outlawed Manipur militant groups in Imphal on the eve of 71st Independence Day marked a landmark in The Art of Living’s efforts of bringing peace in troubled areas. 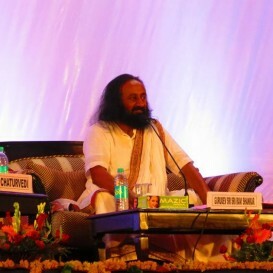 Sri Sri Ravi Shankar addressed over a thousand scientists from ISRO. 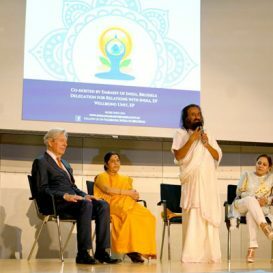 A call for ensuring a human face in the era of artificial intelligence marked the inaugural series of the “World Forum for Ethics in Innovation” at the German Patent Office in Munich. 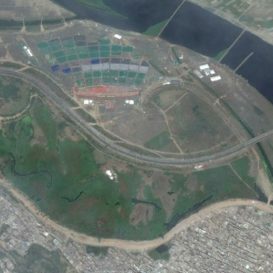 The Expert Committee report is based on a single satellite image dated 5 September 2015 which was during the peak monsoon season, to show that wetlands existed on the event site. 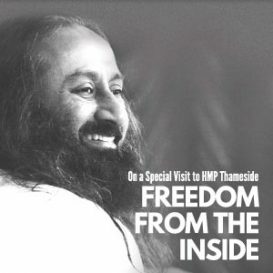 This is distortion of actual facts to deliberately mislead the tribunal. 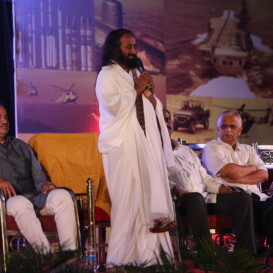 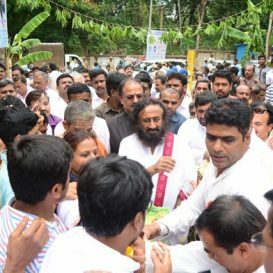 Sri Sri Ravi Shankar addressed a gathering of 1200 professionals and students at Whitefield. 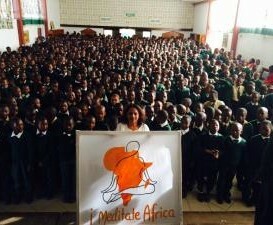 I Meditate Africa conducts mass peace meditations/prayers for Africa at schools, colleges, universities, prisons, factories, churches, corporates, for an entire month across the continent, culminating with a guided Peace Meditation on Africa Day with Sri Sri Ravi Shankar. 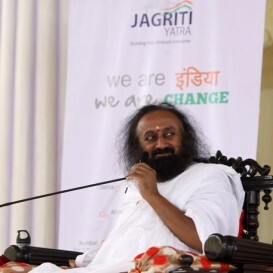 No contempt notice has been issued by the NGT to the Art of Living or Gurudev Sri Sri Ravi Shankar. 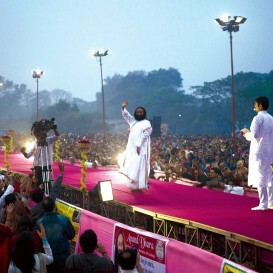 Media reports are baseless and false. 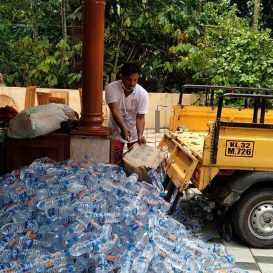 The matter has simply been adjourned to 9th May 2017. 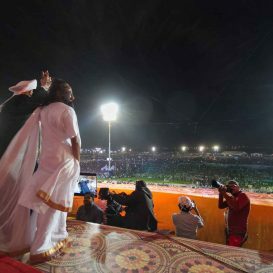 Why did the authorities give permission for WCF if Yamuna was so fragile? 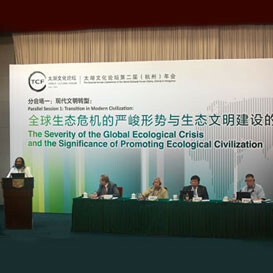 I invite all honest environmentalists to study the case and unveil the truth. 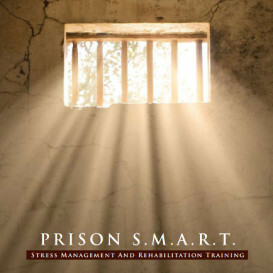 The report is completely flawed, unscientific and biased. 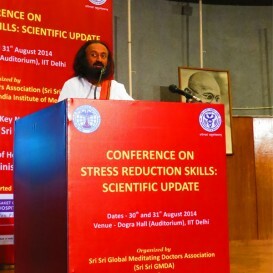 We have placed significant material on record before the NGT which clearly shows that the Committee is biased. 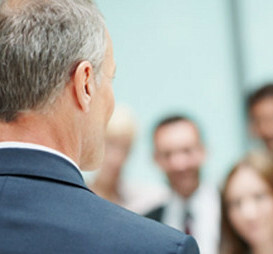 Our application in this regard has not yet been heard. 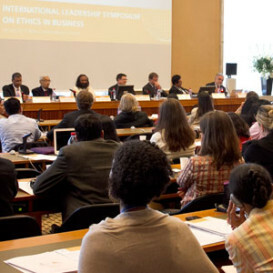 We do not trust this Committee. 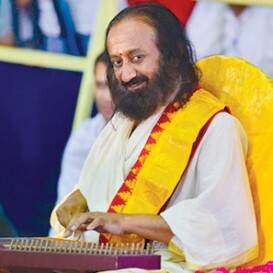 It has disqualified itself by its blatantly biased conduct. 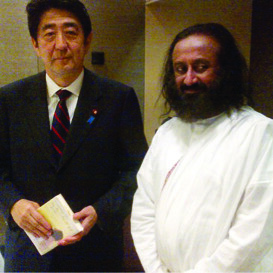 Japanese lawmakers are now part of a parliamentary league for promoting yoga, which was inaugurated by Gurudev Sri Sri Ravi Shankar. 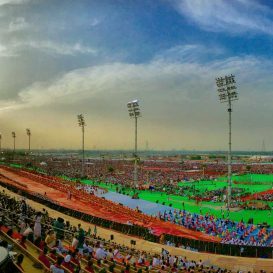 The magic of one lakh people from 100 countries meditating, singing & chanting together lit-up Art of Living International Center on Mahashivratri. 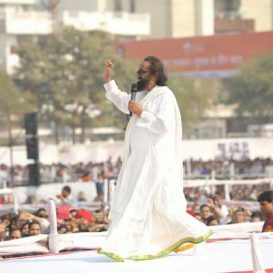 I appeal to the people of Tamil Nadu to keep calm and not let anti​-​social elements hijack the peaceful nature of the Jallikattu movement. 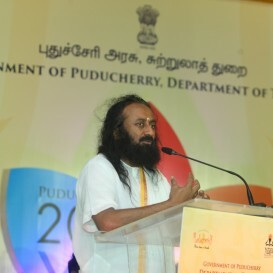 Jallikattu is ​a game for which both the bull and the people are prepared well. 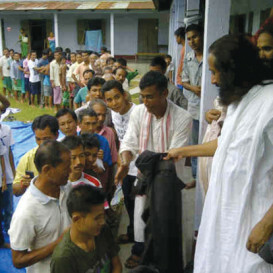 If we want to genuinely show our love for animals, let us focus on banning slaughter houses, which ar​e endangering the indigenous breeds of animals. 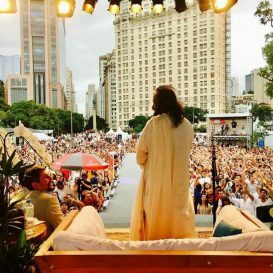 Sri Sri toured as many as 13 cities across eight nations in Latin America as part of his ongoing efforts to usher peace in world's most violent regions in South and Central America. 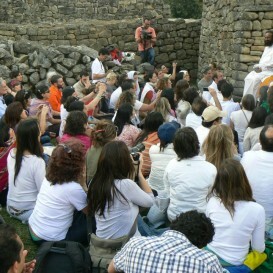 Gurudev is on a 20-day peace mission to South and Central America from 29th November to 19th December. 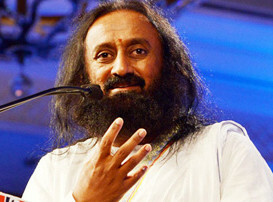 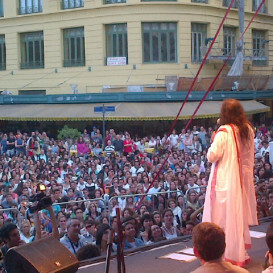 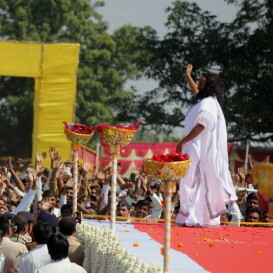 "Peace is relevant only in times of strife," said Sri Sri on his tour. 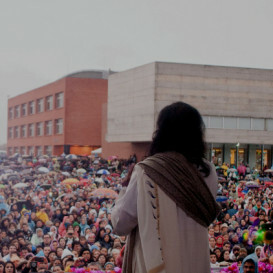 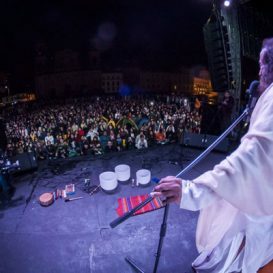 After the past successful tours that culminated in the FARC committing to non-violence and a big thrust to the historic peace deal for Colombia, Gurudev is back in Colombia at the invitation of the Colombian government to take the reconciliation process forward. 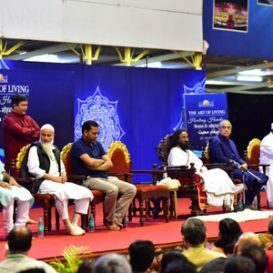 Gurudev brought together multiple stakeholders to have a dialogue on the situation in Kashmir as part of the ‘Kashmir Back to Paradise’ Conference. 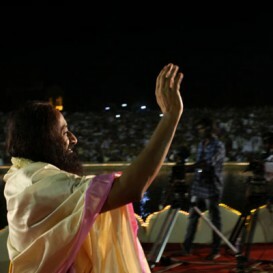 I request everyone not to panic. 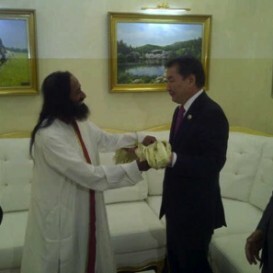 The demonetising of high value currency is good for the country. 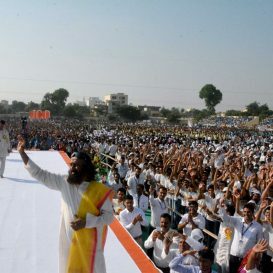 It will curb corruption, black money and terrorism. 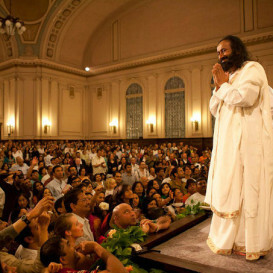 Sri Sri will address members of the French Parliament in Paris, a city ravaged last year in one of the world’s dastardly terror attacks. 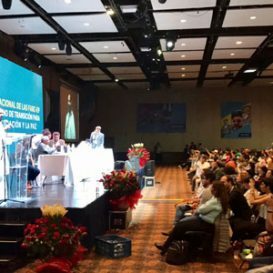 Today, in Colombia, in the referendum to ratify the peace agreement between President Santos and the FARC Group, a narrow margin divided the yes-or-no vote, with 49.8 percent voting in favor and 50.2 percent of Colombians rejecting it. 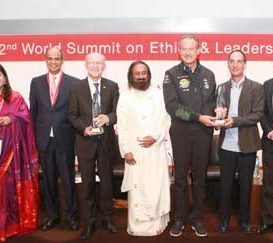 Solar Impulse, the FC Basel leadership team and UN’s Peace and Sports Ambassador Wilfried Lemke were the recipients of the award that was presented today at the Home of FIFA in Zurich. 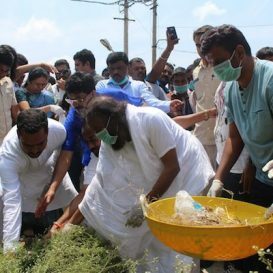 Whatever has been stated by the NGT's expert committee holds no water. 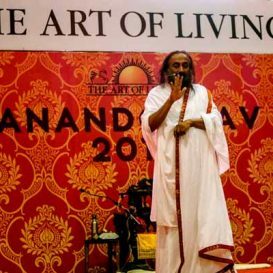 Considering the facts mentioned in the article here, it is clear that the intent of the committee is to merely malign the name of The Art of Living. 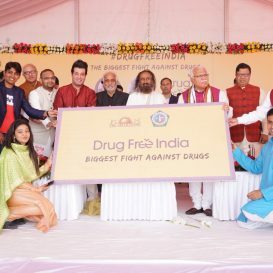 The kind of evidence submitted by this committee amounts to nothing less than a scientific fraud. 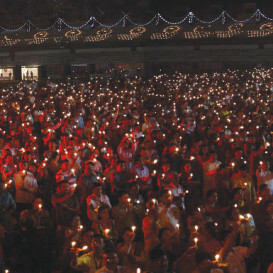 "Everybody must come together - in all ethnic, religious backgrounds. 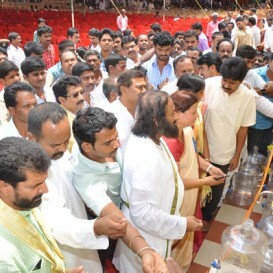 People must see that in unity there is strength, progress and prosperity. 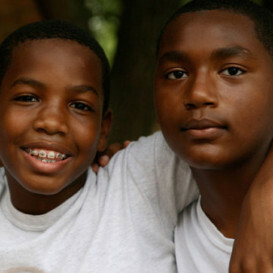 No community can grow in isolation and be happy." 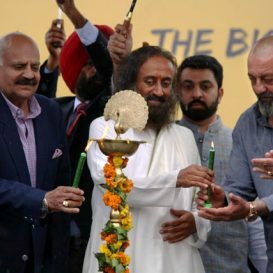 The second day of the World Culture Festival reverberated with hope that the world can come together and work towards peace despite differences in faiths and beliefs. 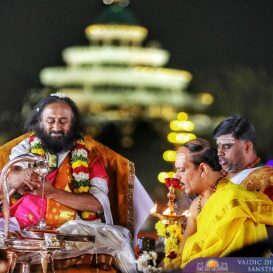 Thousands of international delegates from 80 countries were part of the Maha Shivaratri celebrations at The Art of Living International Center. 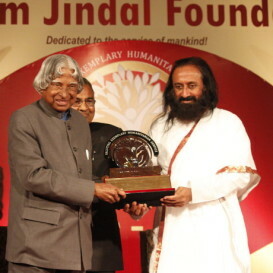 This award is not for a person or personality but for the principle of a one world family where human values are rekindled for our collective happiness and peace. 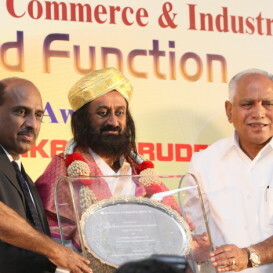 I dedicate this award to all those who work for the same cause. 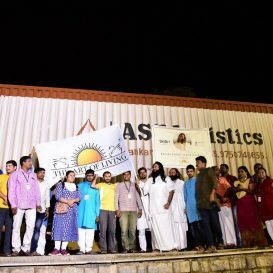 Over 475 young aspiring entrepreneurs part of what is touted to be the world’s largest train journey, the Jagriti Yatra, visited the Art of Living campus in the city today. 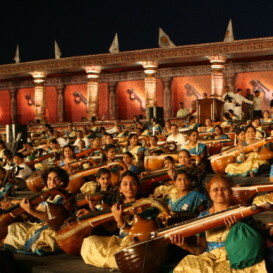 Titled 'Naad Tarang, the symphony had​ 70 Veena artists from different backgrounds performing together in a symbolic gesture for peace and harmony as a curtain raiser for the World Culture Festival 2016. 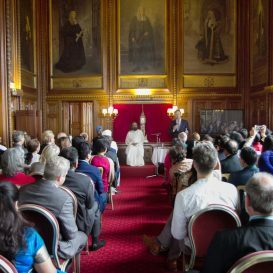 The Art of Living today hosted an active interaction “Britain and India: A partnership for Prosperity” with the Members of the European Parliament, Mr Nirj Deva, Daniel Hannan and its founder Sri Sri Ravi Shankar. 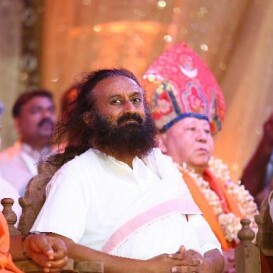 Over 800 internationals from 56 countries celebrated the Indian festival of Navratri at the picturesque Art of Living International Center, in the presence of Sri Sri. 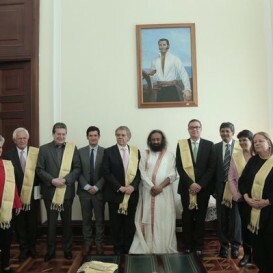 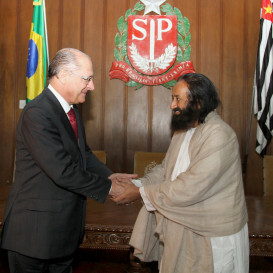 The ongoing peace process in Cuba received a big boost with Sri Sri Ravi Shankar, Spiritual leader and humanitarian facilitating a meeting between the first prosecutor of the International Criminal Court (ICC), Dr.​L​uis Moreno Ocampo, and a peace delegation of FARC (Revolutionary Armed Forces of Colombia) led by Alias Ivan Marquez. 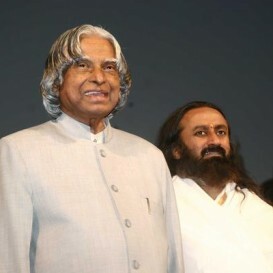 Dr. APJ Abdul Kalam was a President with a difference. 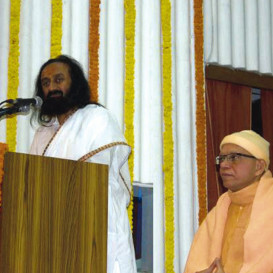 He was deeply spiritual, connected with young people, and worked tirelessly towards uniting people of all faiths. 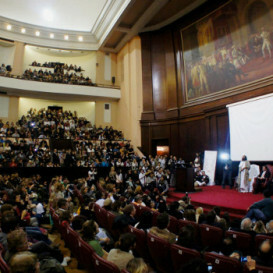 He was a unique combination of science, the arts, and philosophy. 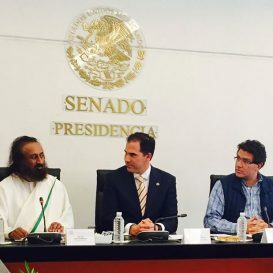 Sri Sri, who is currently in Europe, had a telephone conversation with FARC leader Iván Márquez on, July 6th 2015, through his translator. 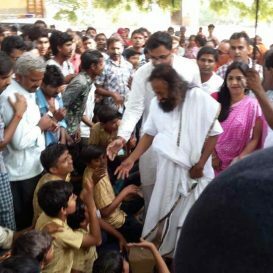 The call served as a strong reiteration to him, to keep his promise of adopting non-violent methods to fight for social justice. 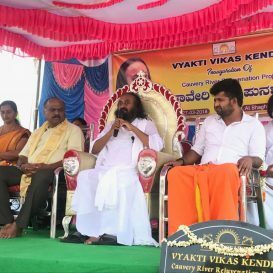 Sri Sri reasoned that if this promise was not upheld, it could prove disastrous and people would lose faith in the peace process. 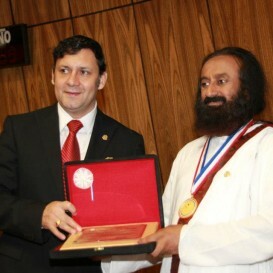 A passionate resolve to work on restoring peace in its country echoed through the corridors of the Colombian Parliament as the President of the House bestowed the country’s highest civilian award on Sri Sri Ravi Shankar. 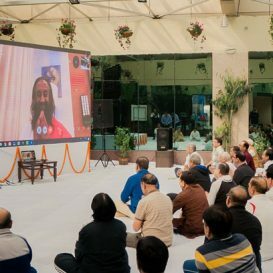 From conflict-ridden areas to corporate skyscrapers to the devotional space, yoga has brought together the whole world in a spirit of unity never seen before. 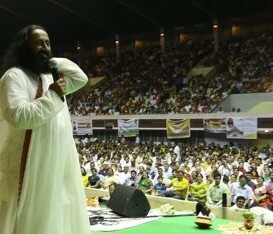 Sri Sri Ravi Shankar inspires over 500 000, in Africa, to meditate for peace. 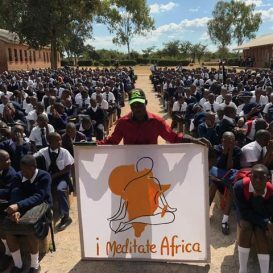 During May 2015, over 500 000 people across Africa meditated for Peace in Africa. 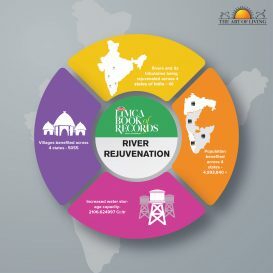 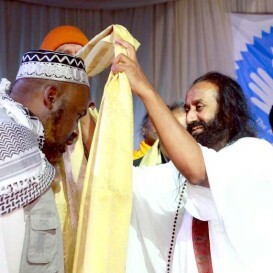 Sri Sri Ravi Shankar marked Africa day celebration on May 23rd through one of the largest African peace initiative, by uniting 25 African countries in a global online peace meditation for the prosperity of the continents people, resources, animals and natures. 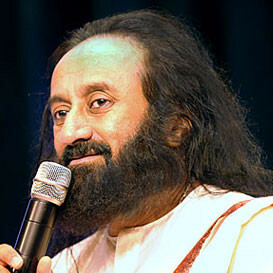 Yoga is like a vast ocean. 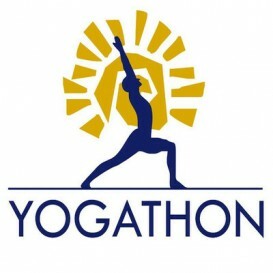 You can just go for a breeze, or you can go with an oil rig and drill for oil ... Yoga offers many things to different people at many different levels--whatever they aspire for: union with the cosmic consciousness, or physical health, mental clarity, emotional stability, spiritual ecstasy -- all this is part of yoga. 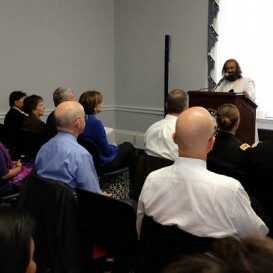 Even as the world gears up to mark the maiden International Day of Yoga, US Congressional Representatives yesterday acquainted themselves with an authentic experience of yoga and meditation with Sri Sri. 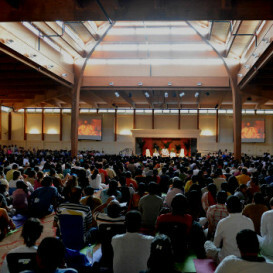 One aspect of the Yoga way is to provide us techniques to lead a stress-free life. 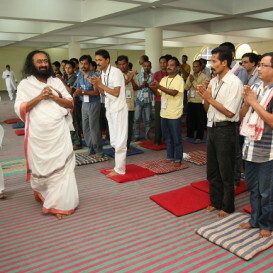 On the other hand, Yoga is also the greatest wealth of humankind. 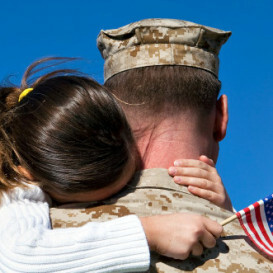 Time is only 24 hours for everybody. 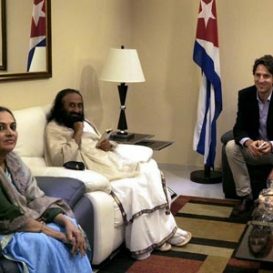 Whether it is a clerk or a prime minister, it is only 24 hours. 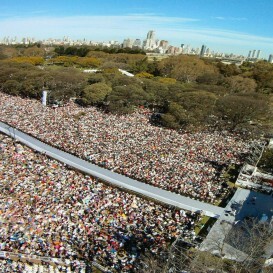 Now, it looks almost impossible to reduce whatever you need to do. 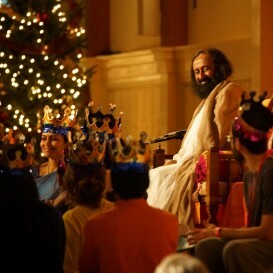 You are left with only one option: to increase our energy level. 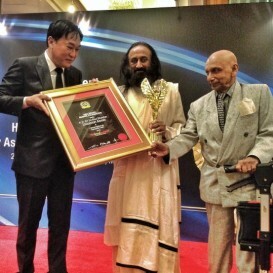 The Art of Living Founder, Sri Sri Ravi Shankar was conferred the prestigious Asia Pacific Brand Laureate Award today in Kuala Lumpur. 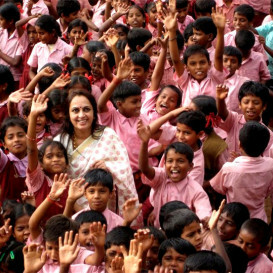 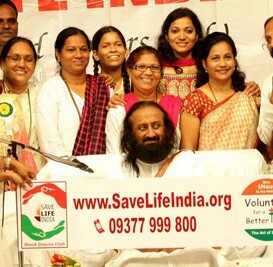 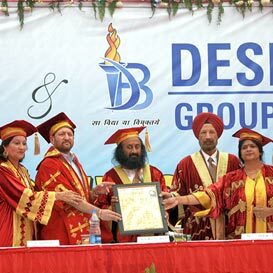 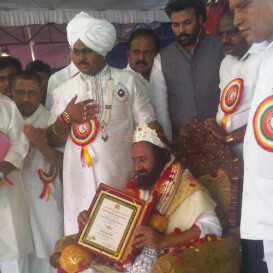 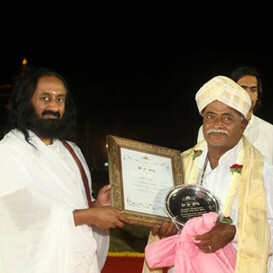 The award was also given to the International Art of Living Foundation for its significant contribution to the world. 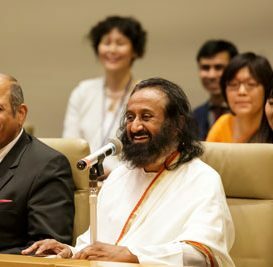 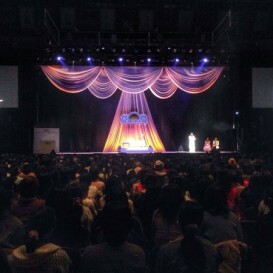 Thousands of people celebrated the World Happiness Day in a live interaction with Sri Sri Ravi Shankar at The Art of Living Happiness Festival in Japan. 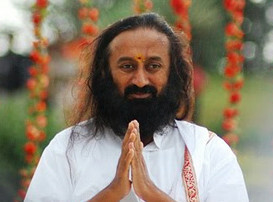 “Shivaratri is the day of Lord Shiva. 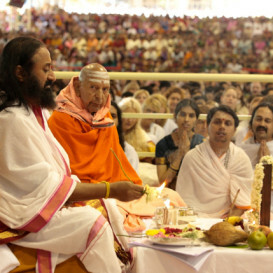 Shiva is the Lord of meditation and therefore the Lord of awakening. 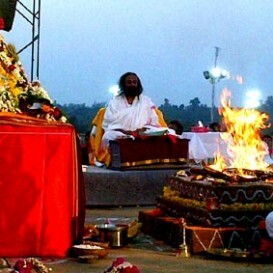 Shivaratri is thus an occasion to awaken one’s self from all sorts of slumber. 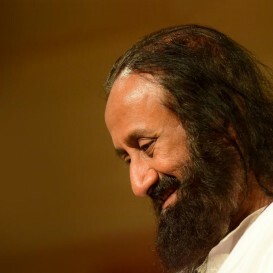 It signifies being aware of everything you have and being grateful about it. 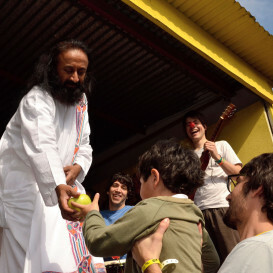 Be grateful for the happiness which leads to growth, and also for sadness which gives a depth to life." 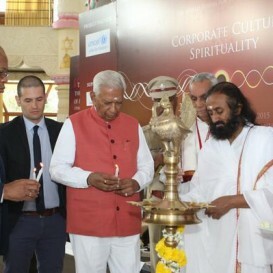 In the backdrop of shifting global landscapes, corporate heads, business leaders, Govt heads and NGO’s, from India and across the world, convened at the two-day annual conference- ‘Corporate Culture and Spirituality’ (CCS) by The Art of Living and the World Forum for Ethics in Business (WFEB). 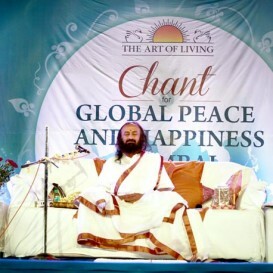 The Art of Living hosted a historic peace concert - Venunaad - in Nashik, Maharashtra, India. 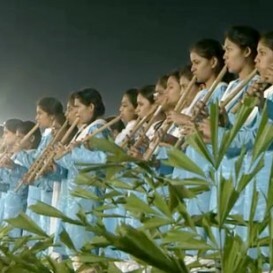 This grand symphony brought together 5378 flutists on one platform, to write a new chapter in the history of music. 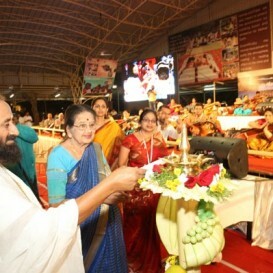 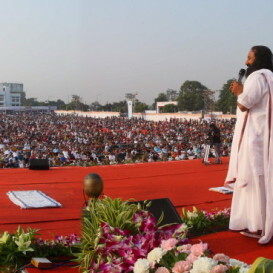 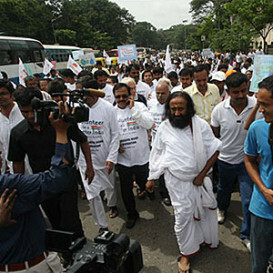 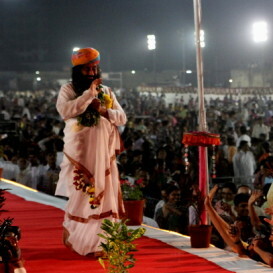 Sri Sri led 3 million people worldwide in the ‘Chants for Global Peace and Happiness' at MMRDA grounds, Mumbai, India. 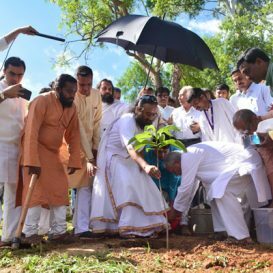 Social and religious leaders from different faiths who also participated in the event applauded the social, cultural and peace efforts of the Art of Living towards the vision of a One World Family. 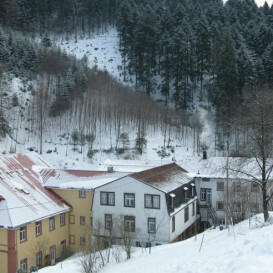 Christmas Celebrations arrive at the time of the year when nature is still and silent. 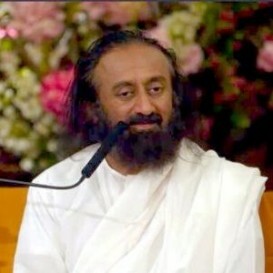 The genuine message of love springs forth when the mind goes within and connects with its source. 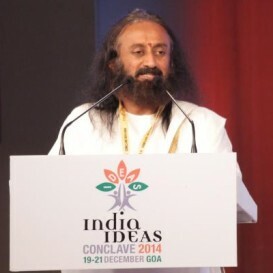 Sri Sri was the keynote speaker at the India Ideas Conclave inaugural ceremony. 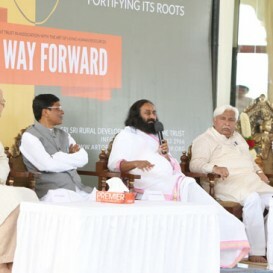 Jointly organized by the India Foundation and the Government of Goa, the conclave's central theme is that of ‘Integral Human Development’. 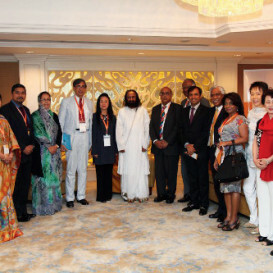 The conference brought together social and government leaders, industrialists, spiritual leaders and other thinkers from around the world to discuss different aspects of India's development. 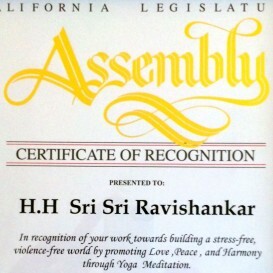 I congratulate Hon. 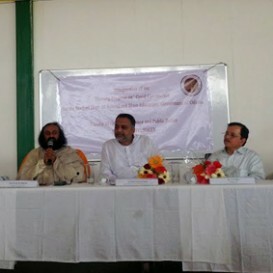 Prime Minister Narendra Modi on the United Nation’s declaration of World Yoga Day. 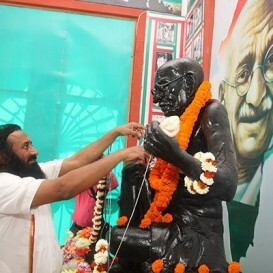 It is very difficult for any philosophy, religion or culture to survive without state patronage. 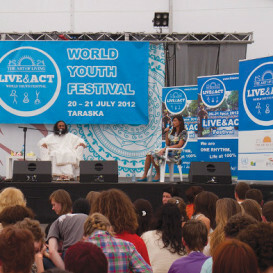 Yoga has existed so far almost like an orphan. 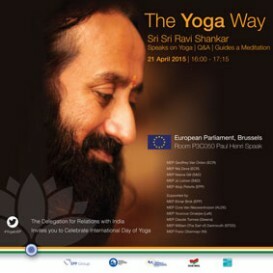 Now, official recognition by the UN would further spread the benefit of yoga to the entire world. 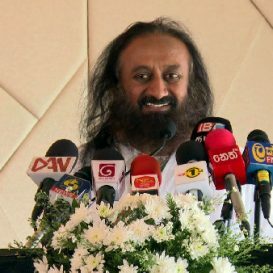 Taking the call for peace to the middle of the conflict zone, renowned spiritual leader and founder of The Art of Living, Sri Sri Ravi Shankar addressed a peace conference in Erbil in Kurdistan, the violence hit province of Iraq on thursday. 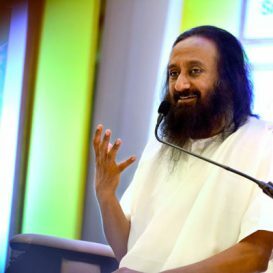 Pitching for co-existence, compassion and commitment to peace, Sri Sri said, “Peace conferences are held where there is peace. 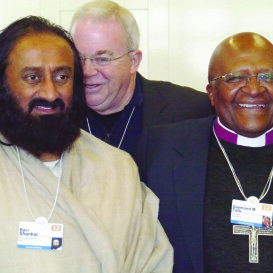 I wanted to do this conference in middle of conflict." 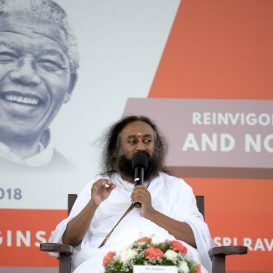 Sri Sri will be visiting the relief camps where IAHV will also hold a conference in the Kurdish capital of Erbil on November 20th titled "Protecting Women and Bringing Stability and Peace". 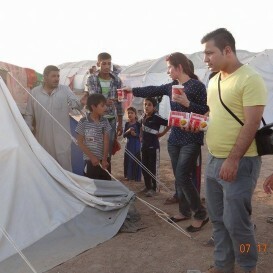 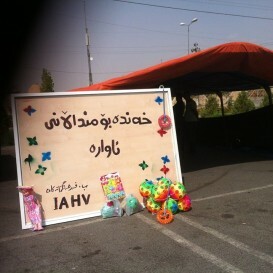 Thousands of Christians, Yazidis and Kurdish Shias are languishing in camps in Erbil, Duhok and Khazir. 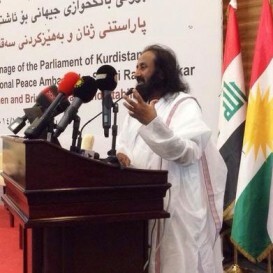 Sri Sri Ravi Shankar today called on government officials in Europe, United States of America and India to address the situation of thousands of Yazidis trapped in the Sinjar Mountains In Iraq. 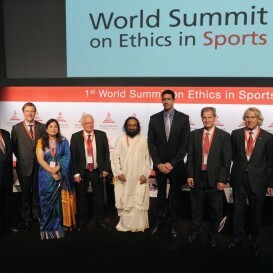 For the first time, leading decision-makers from sports, politics, business, academics and NGOs converged in Zurich to define the role of sports in solving societal problems and to celebrate ethical sportsmanship at the World Summit for Ethics In Sports (WFES). 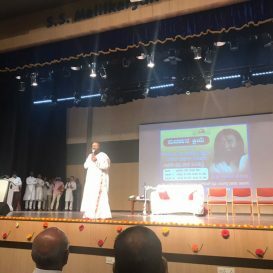 Sri Sri spoke about Success and Happiness to an audience of over 2000 students and faculty of the Birla Institute of Management and Technology followed by a guided meditation. 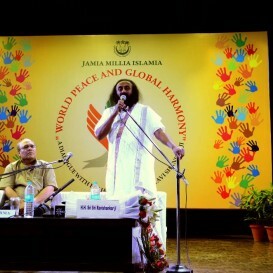 Sri Sri spoke on World Peace & Global Harmony, which was followed by a guided meditation. 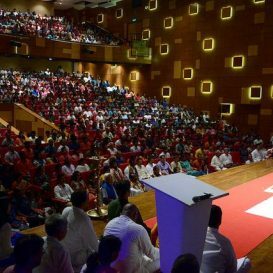 Afterwards, the audience of over 400, which included faculty members, students and staff of Jamia Millia Islamia, interacted with Sri Sri in a question & answer session. 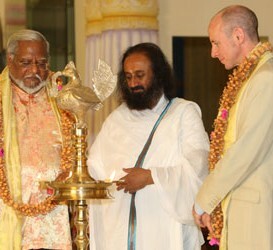 The Art of Living hosted a reception to honour H.E. 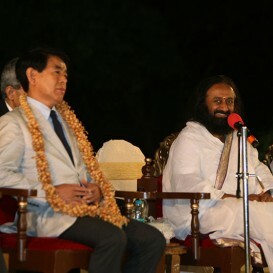 Mr. Hakubun Shimomura, Minister of Education, Culture, Sports, Science and Technology of Japan, on August 7th ,2014 at its International Centre, Bangalore. 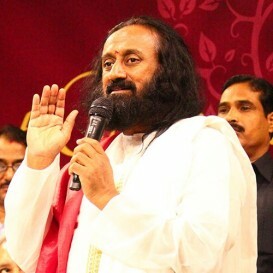 Sri Sri inaugurated the North American International Ayurveda and Yoga Conference at the Art of Living Retreat Center in Boone on 4th July 2014. 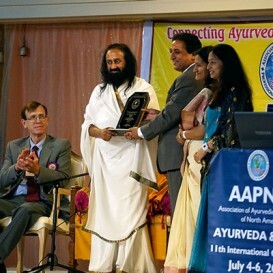 It was hosted by AAPNA (Association of Ayurvedic Professional of North America) where doctors and professors from Harvard, Yale and other leading universities also participated. 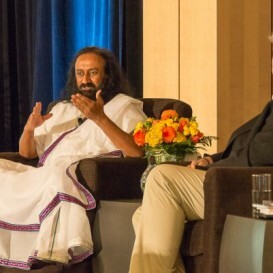 Sri Sri Ravi Shankar with Dr. James Doty, Founder Director of CCARE (Center for Compassion and Altruism Research and Education) in Stanford on July 1.The Center for Compassion & Altruism Research & Education (CCARE) at Stanford University hosted a dialogue on the topic of compassion. 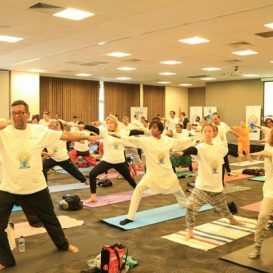 While fear and uncertainty looming over large part of Iraq, two Art of Living Faculty members Christoph Glaser and Mawahib Shaibani embarked on a mission. 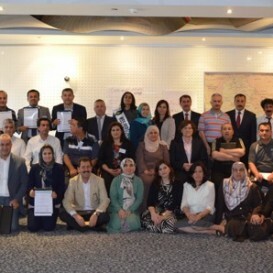 They began imparting leadership training and peace building initiatives to 35 Members of Parliament in Arbil, Kurdistan, Iraq. 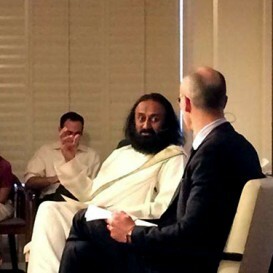 Arthur Brooks, president of the American Enterprise Institute (AEI), hosted Sri Sri Ravi Shankar to continue a conversation about human flourishing that began when AEI invited His Holiness the Dalai Lama. 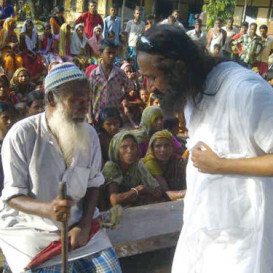 Sri Sri travelled to villages of Bihar spreading his message of peace, non-violence and human values. 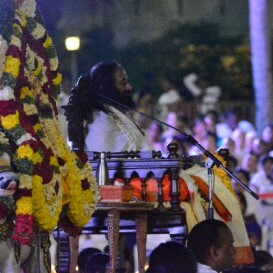 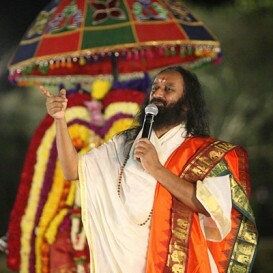 In his address, Sri Sri stressed on imbibing discipline in life. 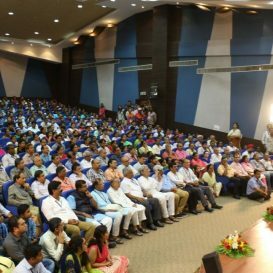 Government can be imposed from outside but discipline comes from within, he said, adding that discipline was necessary for reformers and rulers both. 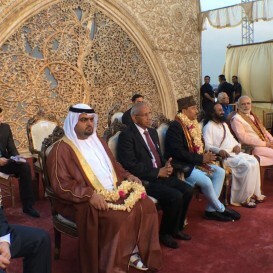 On the Happiness tour of Bahrain, Sri Sri was welcomed by the Royal family and other dignitaries and spoke to the the corporate community on business ethics, clarity of mind and spirituality being essential for creating a stress-free society. 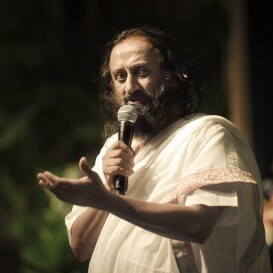 Sri Sri was the keynote speaker at the Maruti Suzuki Convention to inspire the crowd on ‘The Way of Life’ on May 4 in Rome, Italy. 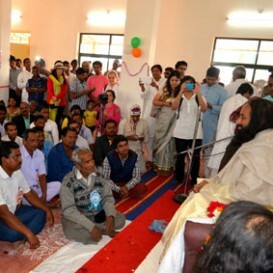 He underlined the importance of a cordial and stress-free atmosphere at work places. 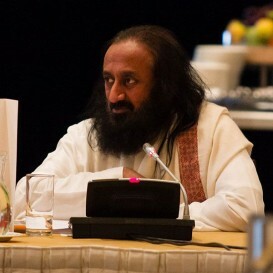 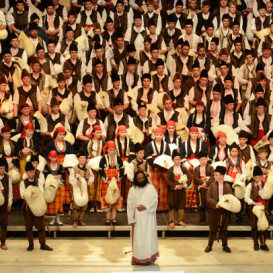 Sri Sri Ravi Shankar speaks at the Interfaith Council in Vienna on March 26th. 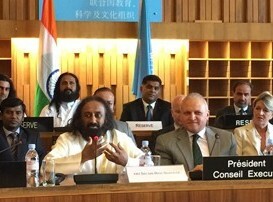 Convened by German Chancellor Helmut Schmidt, the forum comprises former heads of nations and deliberates on current issues in the country. 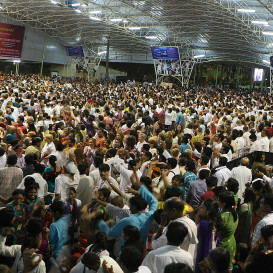 Thousands gathered at the Art of Living International Center in Bangalore, India to join Sri Sri in the traditional Shivaratri celebrations. 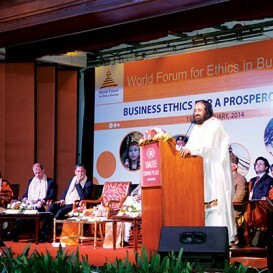 The World Forum for Ethics in Business conference was held in Nepal with the theme - Business Ethics for a Prosperous Nepal. 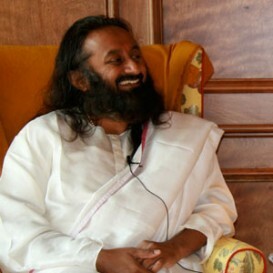 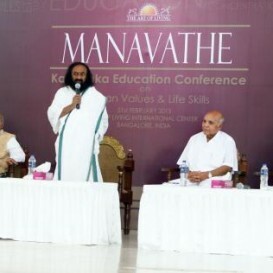 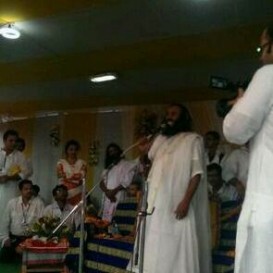 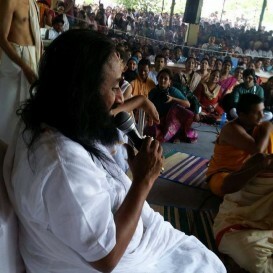 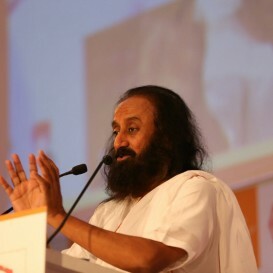 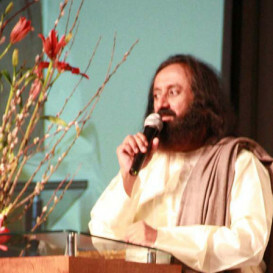 Speaking at the event, Sri Sri said; that only ethical practices provide happiness. 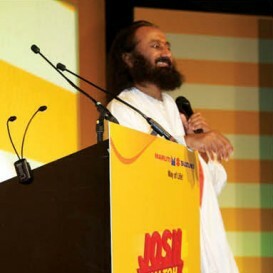 Stating that wealth without happiness would do nothing, he urged people to change their mindset towards business. 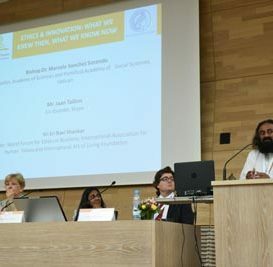 From being a solution for combating alcoholism to improving communication skills, Sri Sri Ravi Shankar shared insights into the science and practice of yoga at the 20th International Yoga Festival. 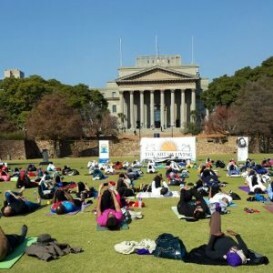 The audience of yoga enthusiasts, which numbered over 1100, seemed to concur as they experienced a variety of yoga-centric seminars at the four-day festival. 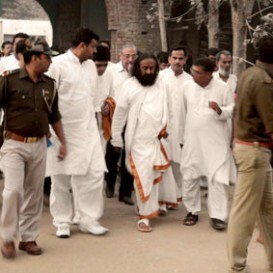 On October 26th 2013, Sri Sri met with the families of the riot victims in Muzaffarnagar. 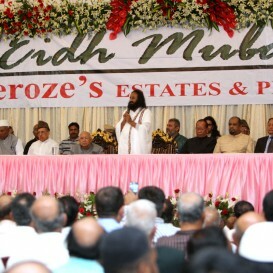 He emphasized the need for restoring mutual trust among the communities. 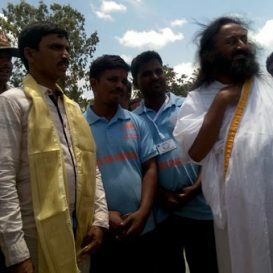 “Peace and harmony is needed to ensure progress and development,” he said.Sri Sri was embraced with equal anticipation by people from either side of the hostile communal conflict. 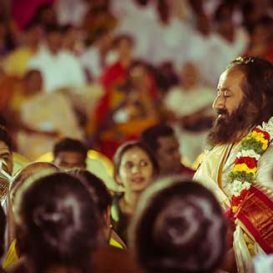 A soul-stirring choir of 12,000 sang the Jnanappana, a traditional devotional poem from Kerala, at the Independence Day celebrations on August 15th hosted by The Art of Living at its International Centre in Bengaluru, in the presence of Sri Sri . 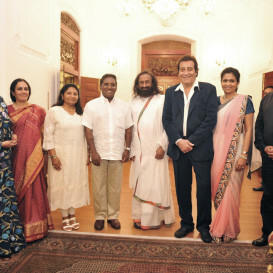 The Rainbow Forum & Feroze Abdulla invited Sri Sri for a unique Harmony Lunch to celebrate Ramzan Eid. 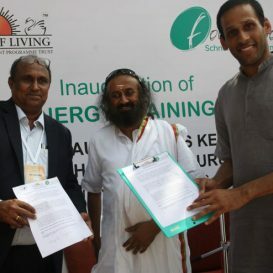 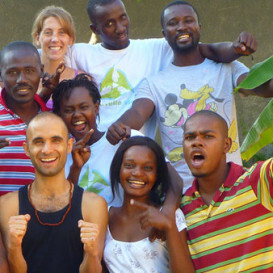 The Art of Living Foundation offers educational and self-development programs and tools that eliminate stress, foster inner peace, and create well-being. 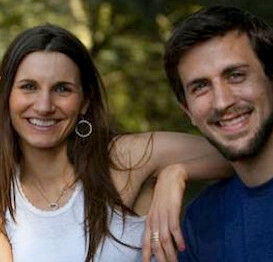 These programs include breathing techniques, meditation, yoga, and practical wisdom for daily living. 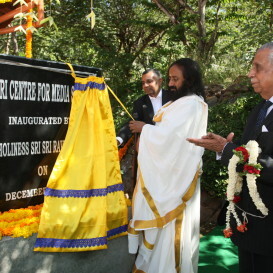 Sri Sri inaugurated the new campus of the Sri Sri School of Media Studies along with Padma Vibhushan Sri M.N. 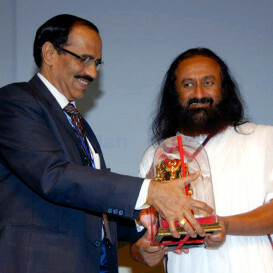 Venkatachaliah, Former Chief Justice of India and former Chairman of the National Human Rights Commission.